100 years ago Oberhof experienced the birth of the German winter sports. Hotel directors, building tycoons and spa doctors discovered sports as a source of income. The nobility enjoys the winters at the bob and sleigh runs. Within a few years the mountain farmers’ village looks like St. Moritz. A breathtaking adventure begins that finds its climax in Walter Ulbricht’s vision of an exclusive winter sport resort in a republic “without a real access to the alps”. When in the 60s and 70s new jumps, a costly skating rink and the Interhotel Panorama, the number one address of the GDR, is built, the German Democratic Republic fulfills in public property what had coined the place for decades: a place ruled by the powerful, the peacocks, the top-level functionaries and independent gentlemen. 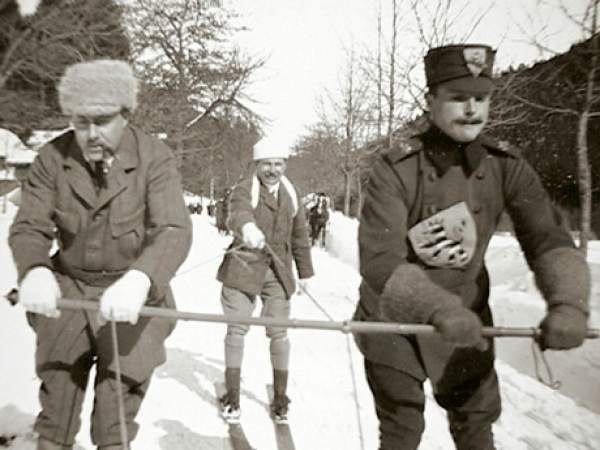 Here, crown prince Wilhelm goes bob sleighing, the last Russian prince Kyrill improves his handicap, Joseph Goebbels spends his holidays, and the stars of the Ufa film studios reside at the golf hotel. It is this mixture of great competitions, guilty pleasures and high society meetings that makes this place so irresistible for the elites – during the empire, the 1920s, and the Third Reich. Walter Ulbricht’s dream of a “St. Moritz of the GDR” is being fulfilled here, too: His own guesthouse is built in 1964, the Panorama Hotel in 1967, the skating rink in 1969. The people who defy here at the altitude of more than 800 m November fogs, cool summers, lots of snow and thawing, expect money or a great career as a trainer or barman, Olympic champion or star chef. With lots of archive footage and eye-witness accounts the film tells the largely unknown story behind the façade of Oberhof. Newsreels and historic documents bring the place back to live, interviews with historians, functionaries, hotel directors and athletes tell the fascinating story of a place whose destiny was determined by the societal and political establishment of the last century.